For more than a decade, the market has been inundated with very cheaply made replicas of vintage pocket cornets, evidently made in India. These are very easy to identify as the two makers’ names were never on the same instrument, and one is misspelled. Further, they all bear the same serial number as shown below! 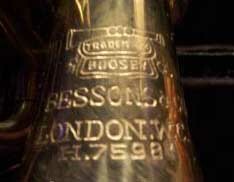 More recently, examples have appeared which just say Class A, Boosey & Co. If this is the stamping, then you have to rely on the design and details to identify the counterfeit. Another easy to spot feature is the odd finger buttons which are hexagonal when viewed from above. Note that these may be highly polished, as if new, or with deep patina suggesting extreme age! 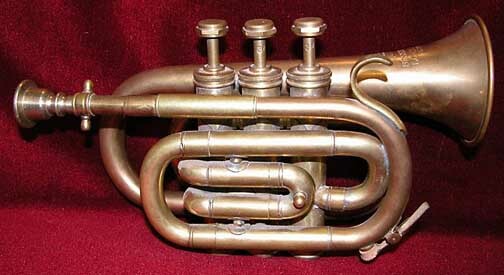 These “Bessons” cornets appear continually on Ebay and other web sites. They have value only as curiosities, being of very poor quality and as such, are virtually unplayable. If you cannot find a genuine vintage pocket and desire an example for display purposes which demonstrates the design and size, then one of these may be perfectly suitable for you.